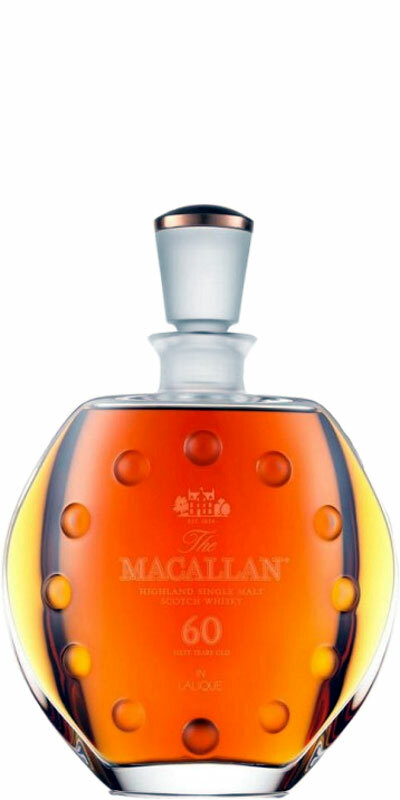 This 2011 release is the fourth in a series of Lalique decanter expressions, and the nose is peatier than modern-day Macallans with notes of cinnamon, baked apples, oak, and a subtle fruitiness. The taste is mouth-filling, vibrant, and smoky with notes of black tea and dark-chocolate covered cherries. The finish is very long and smoky with a touch of cherries. Outstanding! Unfortunately I didn't have a sample big enough to grasp all layers and unravel its complexity. On the other hand it was big enough to know that this is fabulous whisky: it's about much more than just a nice bottle and a marketing story. It's extremely old but also surprisingly fresh and fragrant. A little to my surprise, quite amazing. Is it a drinker's whisky after all? It has an excellent ethereal quality and starts mostly on herbal elements (eucalyptus, rosemary, fir tree honey, parsley) and precious waxed oak. Cinnamon. Classic dried fruits from the sherry, but it develops some lovely fresh fruity notes as well, mainly oranges, apricots and rhubarb. Even tangerine and melon. Very light smoke but not as much as we would have expected from a 1950s distillate. Wonderful freshness overall. Quite full, with more or less the same development. Starts herbal, slightly earthy even and then evolves on dried fruits and toffee. Oranges. Sour plums. Then espresso notes and a nuttiness (peanut butter?). Chlorophyll. A light sourness of pipe tobacco. Walnuts. The tannins are present but they're well controlled given the age. A light peatiness in the background? Not extremely long but not overly dry, mixing fading fruity notes with mint and resin. Nose: Complex, cinnamon, toasted apple and lemon, intertwined with blackcurrant leaf and polished oak, all encompassed by peat. Palate: Mouth-coating, sweet, citrus, dark chocolate and smouldering peat.